Just wanted to give you an update on our walking team. We are now well over our goal of $1,500. We're over $1,700! And, I still have 3 people to donate who said they would and Jody and Leah have yet to enter their people. We'll have over $2,000. Doesn't seem like a ton, but at least it's helping the fight! Now....I just have to get out there and walk....yikes! I think Neil and I are most concerned with keeping up with my 65 year old mother...truly. I'll keep you posted on 'your' team! Sorry I've taken so long to say THANKS for the stickers! The extras were much appreciated! 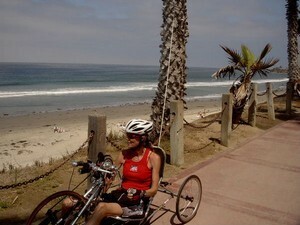 I was waiting to get a picture of me on my handcycle with my helmet on for you. You can't see the sticker very well in the picture, but it's there. I'm guessing from your email address and envelope return that you're involved with bicycles? Well I finally got someone to get a picture on the 4th of July during a morning beach ride. My bike is awesome! It is aluminum, has 21shimano gearing, VERY light, and is a "leaner". A leaner means it steers by body leaning not handlebar turning. I feel like a superbike racer on it. yah right! I don't know why more with MS don't know about them. I have never met anyone else with MS who knows about them. My ride and race buddies are mostly amputees and paras. My handcycle gave me back a part of my life I had lost when I couldn't ride my Cagiva anymore. SPEED, INDEPENDENCE, COMPETITION, EXERCISE, AND FUN! And no one knows I'm disabled when I'm on it. They are shocked when they look at my bike and ask about it. I recommend them to everyone I see in a wheelchair. HEY JIM, THOUGHT YOU MIGHT LIKE TO KNOW A GUY WITH TEAM M.S. 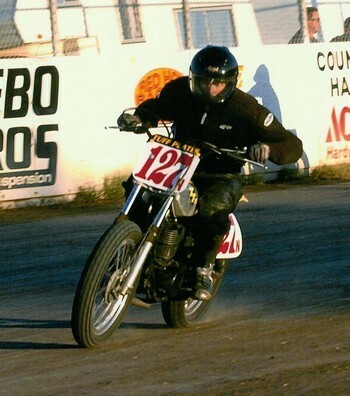 STICKERS ON HIS BIKE WON THE VINTAGE CLASS LAST NIGHT AT THUNDERBOWL SPEEDWAY TT. ARE YOU STILL RACING? HOWS THAT GOING? ANYHOW JUST WANTED TO GIVE A REPORT THAT GUYS WITH M.S. 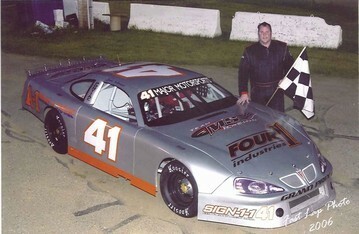 ARE STILL RACING AND WINNING IN THE GOOD OLE U.S.A.
Jon Minor has been busy this last year racing under the Team MS banner. I asked Jon why he was interested in running the team logo and he answered that he has been fortunate in his life and he wanted to do something that would help people. We need more people like Jon in the world. SURVIVED OUR FIRST BAJA TEST!! Team MS/David Bailey/Pro-Tec (264x) completed the Baja 250 last weekend, the first step in our goal of completing the 500. It proved to be a good idea to use the 250 as a precursor to the 500 to familiarize us with the logistics of racing in Baja. We learned that racing in Mexico is a whole different ballgame. The ordeal was a very exciting 5 days for our team which consisted of my two sons Dana and Cody and I. The three of us drove the couple hundred miles down to Ensenada on Wednesday pulling our toybox with our race XR650R and CRF250X pre-runner. We completed our pre-running on Thursday; on Friday we signed in, went through Tech and rested. On Saturday we raced, the boys covered the majority of the distance, I cruised to the finish. We enjoyed all the finishing activities provided by Tecate Beer and then collapsed in bed. Our primary racing goal was to finish, our secondary goal was to finish in the top 10 in our class. We finished 22nd, a little disappointing. Our time was off by about an hour because of air filter problems in a silt bed and shock problems because of a hard get-off by my oldest son Dana. All in all it was a fun, exciting endeavor, we enjoyed some beautiful scenery, a chance to mingle with the locals and some of the best riding imaginable. We endured the border crossing and arrived home on Sunday.